Effectiveness: 4.5, Does a lot. Most of it pretty well. The Birdicorn is in a crowded space and one that, at least on the surface, does not lend itself to much room for innovation. 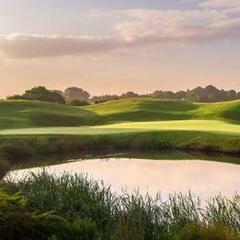 I mean, what are you going to do to improve the divot tool? A usable ball mark repair tool has to work the way golfers expect it work and it needs to fit in a pocket. It must be easy and effective to use, and, while being carried, it can’t be prone to sticking its users in the leg (or someplace worse). And if it doesn’t meet those expectations it has to sufficiently motivate users to change their behavior. 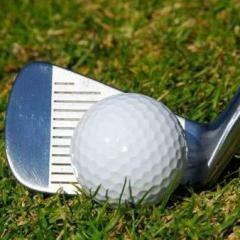 Birdicorn has found a way to differentiate itself, not by creating a new way to fix a ball mark, but by doing a whole bunch of things that other divot tools don’t do. 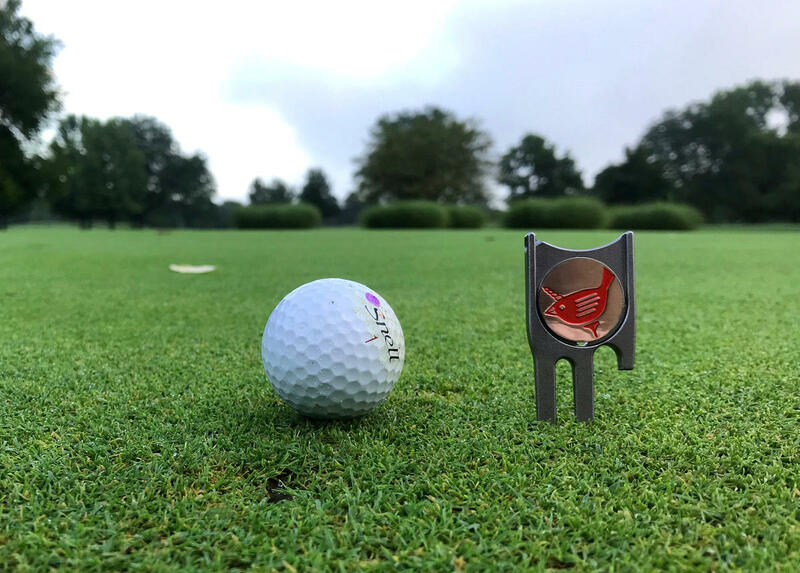 It’s a ball marker, it holds a club or cigar, it’ll open a beer bottle, it cleans grooves, it slices, it dices, … OK, not those last two, but it will fix a divot quite adeptly. For me that’s the main selling point of the Birdicorn, it packs a lot of functionality into a pretty small package. Like others, I consider some of those functions less compelling than others, but, still, they are there to use if you want them. 1.) Ball Mark Repair: If a divot tool doesn’t make it easy to fix a ball mark well, forget it. Happily, the Birdicorn does a great job of cleaning up the damage we do on the green. Even making quick work of those craters that result in soft conditions (which I’ve seen a little too much of this summer). 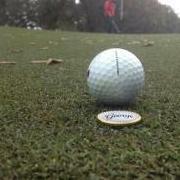 The short “tine” that provides the bottle opening function can even be employed to help close the largest ball marks that much faster. It’s light, fits easily in the pocket and doesn’t poke me when I bend over to tee up a ball. High marks. 2.) Groove Cleaner: I was surprised to like this, but it does a great job of loosening soil that can get compacted into grooves, particularly at the range when many (most?) of us don’t clean our clubs on every shot. 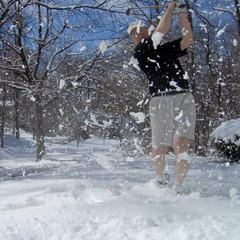 A tee will do this, but the softer tip of the tee tends to dull too fast. 3.) Ball Mark and Holder: The Birdicorn ball mark is always handy, well, almost always. The magnets on my Birdicorn are just a tad weak so the ball mark occasionally slips off in my pocket. I like the ball mark itself. It’s similar in size to the buffalo-head nickels I usually use, and it is easy to see from across the green. 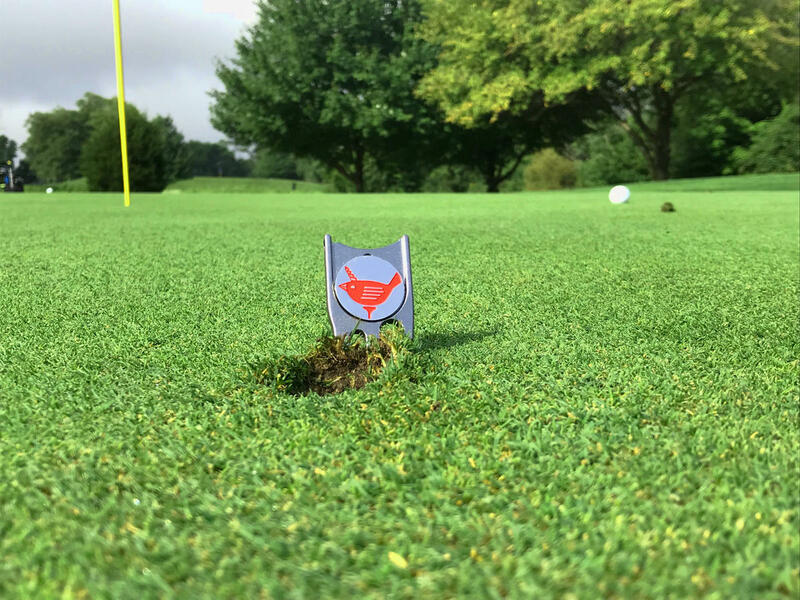 If the Birdicorn logo is not to your liking, you can easily substitute another round, magnetic ball mark since the size is compatible with many that you'll find in golf shops. 4.) Club & Cigar Rest: The other club rests I’ve come across mean you have to carry one more thing. With the Birdicorn, it is built right into the tool. This is a great option to have at hand for keeping your grips off the ground on dewy mornings or after a rain. And if you are using it with a cigar, keep the lit end off the putting surface, please. 5.) Bottle Opener: Not a function that I’ve needed on the course very often, but it’s not bad to have with you when you reach the 19th hole. It works fine but it’s not the easiest opener I’ve ever used. 6.) Ball-Line Stencil: So it works, and I might use it in a pinch if I ever start marking a line on my golf balls again. It’s another usable feature. And though some other options out there might do the job better, Birdicorn gives you one less thing to do. 7.) Putt Alignment Aid: Again, not a feature that I really look for. But those who use an aid for putt alignment, should find it handy to have the function incorporated in something they’d be carrying anyway. Birdicorn combines multiple functions with aplomb. Unlike some bulky golf “knives,” the Birdicorn is thin, light and easy to carry. It feels well made, and mine shows no visible wear after weeks of use. Being able to choose your own color combo online is also a nice feature. The price is a little high for a ball mark repair tool. 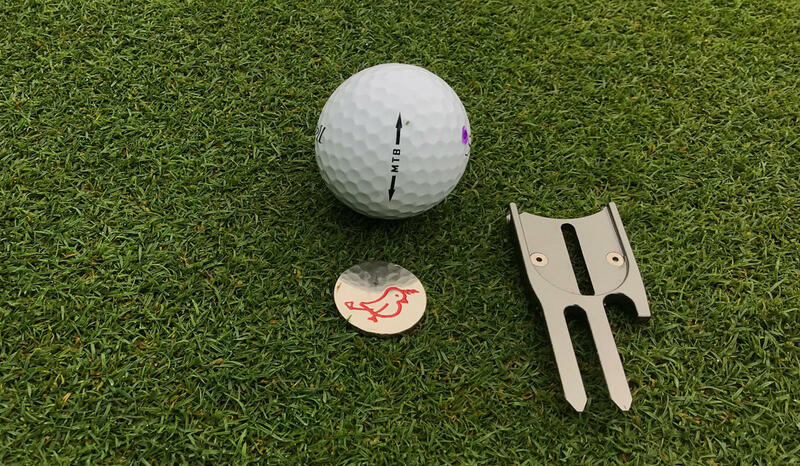 But when you think of it in terms of being a ball mark tool, a groove cleaner, a ball mark, a club/cigar rest, a bottle opener, a ball-line stencil, and a putt alignment aid, the Birdicorn starts to sound like more of a bargain. There are lots of repair tools out there, but few that do as much as the Birdicorn. 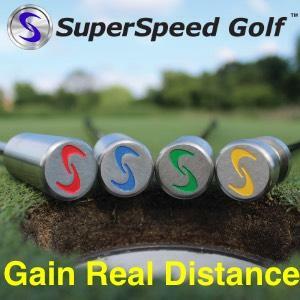 Even if you don’t use all of those functions in a typical round, having them right in your pocket in a single, easy-to-carry unit is a nice bonus compared to the typical ball mark repair tool.